← No bigger pleasure and pain, the family beach house! Saga of the Bad Boxer! I have offiicially uncovered a hidden expense of living CarFree. 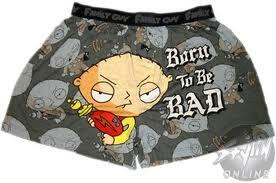 You MUST spring for the good boxers!!!!! I’m a boxer brief man and they have served me extremely well over the years but just like any other variety of underwear, when they go bad, they go REALLY bad! Boxers are one of those items where you get what you pay for but I’m not talking about fancy brand names here. Tradition and experience trump brand name everytime in the boxer game. You need to make sure that whatever boxer you choose, it has the years of experience build into each pair. Every single person has fought the “Bad Boxer Battle” men and women, because bad underwear is universal. It doesn’t see race, gender, orientation or religion. All it sees is an opportunity to make your day miserable. The bad boxer saga was never a huge issue before I went CarFree because my walking and general activity was limited. Therefore, the level of discomfort could be mitigated by stratgic trips to the bathroom for adjustments. My biggest concern was making sure I had a pair of good boxers ready if I had to actually do any real moving around. But these days, it’s a constant battle. Nothing will reveal the weakness of your boxer selection quicker than a mile walk to the train on an 80 degree humid as hell July morning. I don’t think I realized how much can go wrong with a pair of boxers before or that some of my “favorite” pairs from my car days, would turn so viciously against me as soon as I went CarFree. There are just so many factors that can determine boxer success or failure; too loose, too tight, not enough boxer, too much boxer, loose thigh band, tight thigh band, and the all important breathability factor(summer key factor). Waist band issues could be another discussion all it’s own that I won’t get into. After my commute today, I’m going home tonight to roll my quarters and gonna’ spring for a fresh 3-pack of trusty Hanes in blue, red and gray. This entry was posted in Bike commute, Car Free, Uncategorized. Bookmark the permalink. 1 Response to Saga of the Bad Boxer!